With Florida’s 60-day legislative session underway, Gov. Ron DeSantis is well positioned to make this year a landmark for school choice. After nearly two decades at the forefront of the movement, the Sunshine State has bucked the most recent national trend of tighter regulation on charters and strong pushback to voucher programs. In fact, it is charging full speed ahead in the opposite direction, much as DeSantis promised in his hard-fought gubernatorial bid last fall. Now it’s DeSantis’s turn to deliver. “We are a big, diverse state, and one size doesn’t fit all when it comes to education,” DeSantis declared in his State of the State address on March 5 as the Legislature convened. There’s little to stop the reforms. Teacher groups have put up expected resistance, while most of the vocal opposition has been confined to the op-eds of local newspapers around the state. With ideological alignment between DeSantis, legislative leaders, and a choice-friendly Florida Supreme Court, not much legally or structurally appears to stand between the Republican governor and the education reform agenda on which he campaigned. The governor has laid out an ambitious $91.3 billion budget he calls the Bold Vision for a Brighter Future, which would substantially increase funding for school safety, early education, the Florida College System, and school choice initiatives. The budget, in some ways, serves as an omnibus bill for DeSantis’s education reform plan, while his allies in the legislature filed a flotilla of bills to reduce regulations, create programs, and facilitate charter growth. Should the budget lose steam over some of its pricier line items, Senate Education Committee Chair Manny Diaz is expressing confidence that school choice will still have a good run in the 2019 Legislature. Perhaps DeSantis’s most notable move so far — and a sign of things to come — is a multi-pronged expansion of the state’s school choice funding programs. Florida currently has three primary school choice programs: Gardiner, McKay, and the Florida Tax Credit Scholarship Program. Gardiner and McKay focus on serving students with special needs, and the Florida Tax Credit Scholarship Program is designated for low-income families. The tax-credit scholarship is funded by corporate donations, which are eligible for dollar-for-dollar tax write-offs. The McKay and Gardiner scholarships are private school vouchers and education savings accounts, respectively, funded by the state. Together, they provide private school scholarships, public school choice, or education savings accounts to 142,000 Florida students. DeSantis’s Bold Vision budget would pump an additional $19 million into the Gardiner Scholarships to serve 2,000 disabled and special education students now on the program’s waiting list. Gardiner Scholarships can be spent on a range of educational services or therapies, as well as for tuition to some private schools and contributions to prepaid college savings accounts. “We have seen proven success with this program, and I look forward to working with the legislature so that nearly 2,000 students can receive the scholarship they need and deserve,” DeSantis said at a press event highlighting this item in the budget. At the same time, the Senate education committee has filed a bill to create a new scholarship to address the 14,000 students on the waiting list for Florida Tax Credit Scholarships. The “family empowerment scholarship” would allow state funding to go to whichever school families choose for their children. The Florida House has filed a similar, broader bill that would make it possible for families of four earning almost $100,000 per year to qualify for scholarships. Florida’s teachers union spoke out against the program, citing the underfunding of public schools, which Politifact FL puts at pre-2008 recession levels, when adjusted for inflation. The Bold Vision adds $50 per student to the base allotment for per pupil funding, still not enough to recoup those losses. The Senate’s Family Empowerment Scholarships are more limited than the Gardiner Scholarships and would cover only tuition to private schools, not other services, though Diaz said he’s not closed to seeing the scholarships opened up to multiple services. Former governor Jeb Bush tried to fund school choice scholarships for students in low-rated public schools directly from the budget. Courts declared his Opportunity Scholarship program unconstitutional, citing the possibility of public funds flowing into private and religious schools. The private donor tax breaks and nonprofit administrators allowed the current tax-credit scholarships to survive legal challenge, though opponents of the new Family Empowerment Scholarships expect to challenge the state-funded program in court. However, Bush did not have the courts leaning his way back in 2004. DeSantis does. When three progressive-leaning judges aged out of the Florida Supreme Court, DeSantis replaced them with conservative judges observers say are unlikely to block the direct funding mechanism. DeSantis, Diaz, and their House counterpart, Rep. Jennifer Sullivan (R-Mount Dora) all want to see the expansion of charter schools as well, but Diaz pointed to a number of legislative actions that need to be taken first. To pave the way for expansion, the legislature could create an alternative authorization process for new charters. Currently, all charters are authorized through school districts. Districts have neither the incentive nor the capacity to speed up authorizing to the pace Diaz says he would like to see. Charters are also limited by their ability to find and fund facilities. The Bold Vision budget includes funding for charter facilities as part of a $510.4 million appropriation for general education infrastructure. Any move to increase charter capacity will see opposition from teacher groups, and public school advocates who see the choice programs — charters, vouchers, and education savings accounts — as siphoning money from public schools. “Regardless of what they are called, vouchers, education savings accounts, tuition tax credits, and other related initiatives rob public schools of vital funding and resources,” said Joni Branch, a spokesperson for the Florida Education Association. Branch also pointed out that traditional public schools still educate 9 out of 10 Florida students. For the 2017-18 school year, the National Alliance for Public Charter Schools counted 661 charter schools serving 302,000 students in Florida. The Florida Department of Education puts the number slightly lower, at 655 schools serving 295,000 students for the same year. The state education department counts 2.8 million K-12 students in the state’s public schools, including charters. An op-ed battle recently played out in the Orlando Sentinel over the issue. However, there are some within the legislature who, while they are for charter expansion, are cautious about the pace. Diaz said he understands that too. “The last thing you want to do is open up school choice in policy without any real school choices people can make,” Diaz said. Right now, he explained, the school choice landscape looks like a quilt, a patchwork of programs and networks that thrive in some places but not in others, for some populations but not others. That’s not to say that every school the free market produces will yield the desired outcomes. Florida opened the doors to charter schools in 1996, with vouchers and ESAs following in 1999. Two decades later, high school graduation rates are rising, but they still fall just below the national average. Charter school students, especially children of color, do outperform their peers on state tests. Fourth-grade NAEP scores have continued to climb over the past 20 years, outperforming the national average. However, those gains have not been matched by eighth- and 12th-grade NAEP scores. 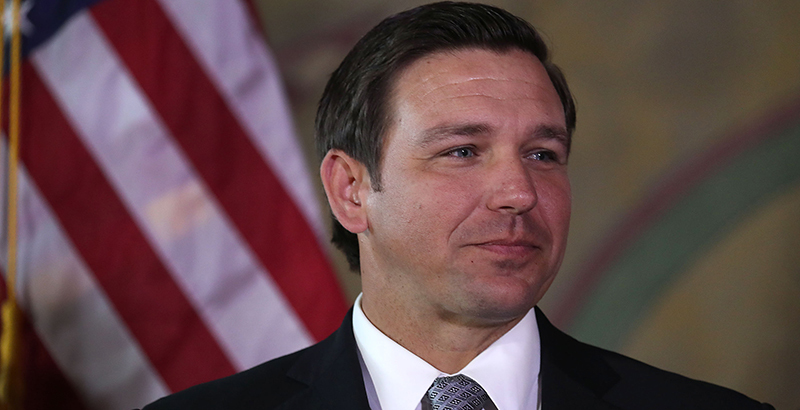 DeSantis’s ed reform agenda isn’t completely dependent on the legislature. Initiatives that don’t involve the appropriation of funds or changing of laws can be carried out by his office and the Florida Department of Education. On Feb. 13, DeSantis issued an executive order on school safety. Florida is home to Marjory Stoneman Douglas High School, where 17 people were killed in a mass shooting in 2018. Though student activism in the immediate aftermath of the shooting successfully moved some gun regulation through the staunchly gun-friendly state, most Republican lawmakers and officials since then have limited the discussion to school safety measures. In 2018, lawmakers passed the Marjory Stoneman Douglas High School Public Safety Act, which, among other things, requires more law enforcement on school campuses and established “guardian” programs that allowed some school staff to carry guns. This year, the legislature is revisiting a bill to arm teachers, a measure that failed in 2018. DeSantis’s school safety order calls for an audit of all school disciplinary regulations, guardian programs, and school-safe officer policies. DeSantis issued what is perhaps the largest executive order on Jan. 31, compelling Education Commissioner Richard Corcoran to replace the Common Core standards with a new set of standards to be developed over the next year. This could change nearly everything about curriculum and instruction in the state, reported Jessica Bakeman for WLRN in Miami. The Common Core, she explained, was the basis for everything taught and tested in Florida public schools. “So if you want to really, truly get rid of the Common Core standards and adopt something new, you’re talking about getting all new curriculum, all new textbooks, all new tests … all of that is really expensive,” Bakeman said in a WLRN news roundtable on Feb. 1. Expensive, of course, means that the new standards will have to be approved by the state legislature next year, but the process is dramatically sped up by the urgency imparted by the executive order. Once the state education department has developed a new set of standards, it can attach a price tag for the textbooks, assessment tools, and professional development required. The new standards can become a bill and their cost a line item in the 2020 budget. Diaz expects wide support for replacing Common Core in 2020. “Nobody is against high standards, but everybody’s really attacking the curriculum,” he said. He echoed DeSantis’s desire to see more civics in school curriculum. Once funded, which is likely if the legislature stays firmly Republican, Florida public schools could see new curriculum and standards in time for the 2020-21 school year. The 2019 legislative sessions ends May 3.